This was another good day to be a Claret; a 1-0 win home win against Watford, courtesy of a Scott Arfield goal, took our points total to 28 from just 16 Premier League games and moved us five points clear of eighth place in the Premier League table, a position now held by Leicester City. This team of ours is in the form of its life but when things do go wrong we do seem to have the ability to bounce back. Just a week earlier we’d been beaten 1-0 at Leicester. I thought, overall, it was probably an undeserved defeat but worse still was the injury to Robbie Brady that will rule him out for some time, almost certainly the remainder of this season. We were without right-back Matt Lowton in that game too, as we had been in the previous game at Bournemouth and for this latest game we also had to find a replacement for acting captain and central defender Ben Mee who missed the game with stitches in a knee injury. There had been threats of snow and such in the days leading up to the game. That was good news to be honest. The weather never quite turned out as bad as expected when Arsenal were here and Watford seem to be another of those clubs who might not fancy a bad day in the north west of England. In truth, there wasn’t anything like as much snow as there might have been. 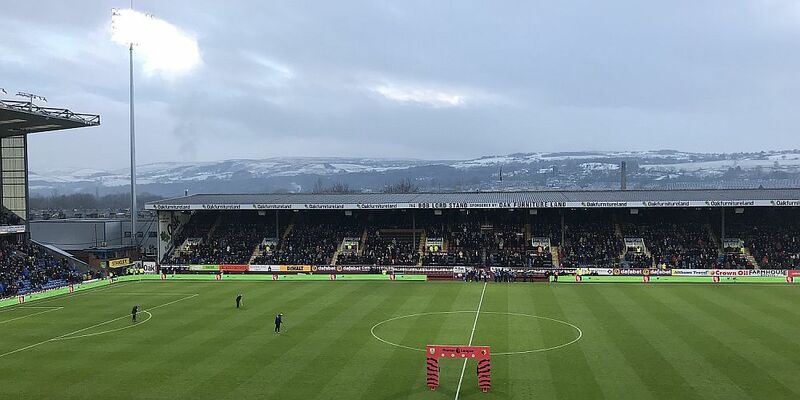 We had a couple of flurries of the stuff pre-match and some during the game, particularly in the first half, but for those inclined to build snowmen and/or throw snowballs it proved to be a disappointment. But it was a cold day and, like many others in and around Turf Moor, I’d packed enough layers on to ensure I’d be reasonably comfortable. Jack Cork it was who led out the team showing two changes from that which started at Leicester. Kevin Long came in for the first time this season to replace Mee, and Scott Arfield, who came on for Brady at Leicester, got his first start since the 3-0 defeat at Manchester City in October. Cork thus became the fourth player to lead out the team this season following on from Tom Heaton, Mee and James Tarkowski who has captained us in the League Cup. Watford, like ourselves, are having a good season so far. They score a few more goals than we do; it was 25-14 in their favour before kick off, although they do concede a lot more goals too. And we knew that should they beat us by more than one goal they would go above us in the table. It looked as if it might be a really tough game for us and it felt that way early in the game with Watford starting well. They had one or two opportunities early in the game. They might have done better with a header from the first corner of the day and Phil Bardsley was alert to get the ball away as they threatened in another attack. It wasn’t looking too good, but Watford didn’t make the most of their good start and the game then, thankfully, started to turn in our favour. Jόhann Berg Guðmundsson is another player in fine form right now and he proved to be a real threat to Watford. He was causing them plenty of problems down our right hand side and when he came inside he won us a free kick that was so close to providing the opening goal. With no Brady, Steven Defour and Guðmundsson are the free kick team. Guðmundsson took this one, placing his shot through the wall where Cork had forced the gap. It looked certain to find the bottom corner until Heurelho Gomes got down to his left to make a fantastic save. He saved well from Chris Wood too after the striker had run on to a Stephen Ward clearance and things were beginning to look good for us. All it needed I thought was a goal to really start to take things away from Watford. And with six minutes to go to the break we got an advantage when referee Lee Probert stepped in with his first big decision of the afternoon. When Marvin Zeegelaar went in on Defour, Probert deemed it worthy of a straight red card and Watford were down to ten men. Needless to say the two managers didn’t agree. Sean Dyche has said he thought the decision was correct but Marco Silva was left fuming with the award. They quickly made a change to get José Holebas onto the pitch but he’d hardly warmed up when we took the lead. Cork nicked the ball from them and played it out to Guðmundsson on the right. It was inevitable he’d be involved. This time, instead of curling in a left foot cross looking for Wood, he played it across the edge of the box. Jeff Hendrick played his part with a nice dummy to allow the ball to reach Arfield. He got round Daryl Janmaat before placing a perfect left foot shot past Gomes into the far corner. That was in the 45th minute and we might have got another in stoppage time when we could so easily have been given a penalty for handball. Probert waved it away and in we went for half time with a 1-0 lead. I suppose, with a one goal lead and playing with ten men, you think it might get easy in the second half. It certainly wasn’t easy although I don’t think Watford ever really threatened to get back into it. They spent most of the time falling down and berating the referee. One incident in particular when Bardsley won a good challenge in his own box, you have to wonder just how bad Tom Cleverley’s protests needed to be to warrant some action from the referee. They may have had a shout for one earlier penalty but when the boy keeps on crying wolf. But the real contentious decisions were at the Jimmy Mac end of the ground where assistant referee Simon Beck twice, bizarrely, flagged Burnley goals offside. The first saw Cork (onside) get onto a ball chipped in by Arfield with Wood (onside) applying the finishing touch. Why on earth he chose to flag Ashley Barnes offside takes some working out. And if that was bad, when Barnes, who was on as a substitute for Hendrick, turned in a ball that had been deflected into his path, we had the farce of referee and assistant having a long chat before they finally got it wrong. Barnes was in an offside position when Arfield tried to play in Wood. He was very definitely onside when the ball was deflected by a Watford player into his path. It was a baffling decision and had we gone 2-0 up then it would have been a very comfortable end to the game for us. Guðmundsson forced another good save from Gomes as Burnley looked to finish it off but at 1-0 it never is finished off and then Watford brought on Andre Gray who, shall we say, received a mixed reception. I just sat there wondering whether the ex-Claret would come back and grab a goal, I’ve seen it so many times over the years. He didn’t, he didn’t even threaten, and with his strike partner Troy Deeney having spent the entire match in the pockets of our defenders other than when he was let out to protest correct decisions along with his team mates, it was never likely that he’d cause us too many late problems either. Oh yes, we kept looking at the watch, and there was a collective, audible show of concern when they won a free kick right on the end of the four minutes of stoppage time as Gomes went up into our box. There was also a collective, audible roar of approval when the free kick was caught by Nick Pope with the final whistle coming just seconds later to signal an eighth win of the season. It was all over, it was another fully deserved win that all but the whinging Marco Silva could see. My word didn’t he whinge while conveniently missing out our penalty shout for handball and our two wrongly disallowed goals from his analysis. If he actually bothered to analyse this game, he’d know his team started well, but he’d also know that they were deservedly beaten and would have been beaten by a bigger score but for his goalkeeper who was, by some distance, their best player. As for us, I think we should all take a step back and take a good look at what where we are right now. It’s difficult to take in but this team of ours is going way beyond all our expectations and to be on 28 points at this stage of the season is ridiculous, far and away better than any of us could have dared hope. Embed from Getty ImagesWe’ve constantly been told this season that this is our best start in over 40 years, with the pointer always heading back to the 1973/74 season. Firstly, it is way beyond being considered a start now with some 42% of the season having been played but I thought it might be worth taking a look back at how some other seasons have gone in the first 16 games. In the aforementioned mentioned 1973/74 season, we’d won seven, drawn six and lost three. In today’s points system that’s 27 points, one less than we have today. To find the last top flight season where we had more than 28 points at this stage, converting the points system, you now have to go back more than half a century to the 1965/66 season. On that occasion we’d won ten, drawn three and lost three for what would have been 33 points and it was even more in the 1961/62 season. And going back a bit further, we’d won 29 points in our championship winning season of 1959/60 season. I’m not suggesting for one minute that we are going to challenge for the title this season, but these stats show very clearly just how well we are doing. We don’t know what’s ahead but, right now, this is a wonderful time to be a Burnley supporter. Even Match of the Day is worth watching as the likes of Steven Defour, and how good was he yesterday, Guðmundsson, Tarkowski, Cork and the rest are being picked out for special praise. We even had Gary Lineker describing us last night as European challengers. It really has been another good weekend to be a Claret and now we can look forward to Stoke and Brighton this week. Burnley: Nick Pope, Phil Bardsley, Kevin Long, James Tarkowski, Stephen Ward, Jόhann Berg Guðmundsson, Steven Defour (Ashley Westwood 90+4), Jack Cork, Scott Arfield, Jeff Hendrick (Ashley Barnes 60), Chris Wood. Subs not used: Anders Lindegaard, Charlie Taylor, Fredrik Ulvestad, Nahki Wells, Sam Vokes. Watford: Heurelho Gomes, Daryl Janmaat, Adrian Mariappa, Christian Kabasele, Marvin Zeegelaar, Abdoulaye Doucourè, Tom Cleverley, André Carillo (Andre Gray 79), Roberto Pereyra (José Holebas 44), Richarlison, Troy Deeney. Subs not use: Orestis Karnezis, Sebastian Prödl, Ben Watson, Isaac Success, Étienne Capouè. Attendance: 19,479 (including 1,133 from Watford).